Last week, Seahawks defensive end Michael Bennett issued a call to action to white players on national anthem protests: “It would take a white player to really get things changed, because when somebody from the other side understands and they step up and they speak up about it... it would change the whole conversation.” A few days later, Eagles defensive end Chris Long followed through, putting his arm around teammate Malcolm Jenkins during the anthem while Jenkins raised his fist, though Long did not take a knee or raise a fist himself. Tonight, Browns tight end Seth DeValve took Bennett’s message a step further—becoming the first white NFL player to kneel during the anthem since Colin Kaepernick began a wave of protests last year. DeValve was one of nearly a dozen Cleveland players who knelt for the anthem before tonight’s preseason game against the Giants. Several other players showed support by standing with their hands on their kneeling teammates’ shoulders. It was the largest anthem protest by a single team so far. Update (1:35 a.m. 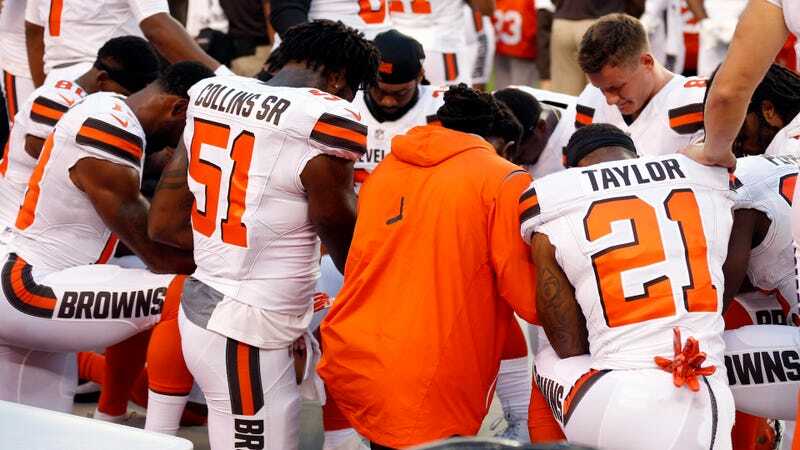 ET): After the game—which the Browns won, 10-6—players explained that they had specifically chosen prayer as their vehicle for protest.